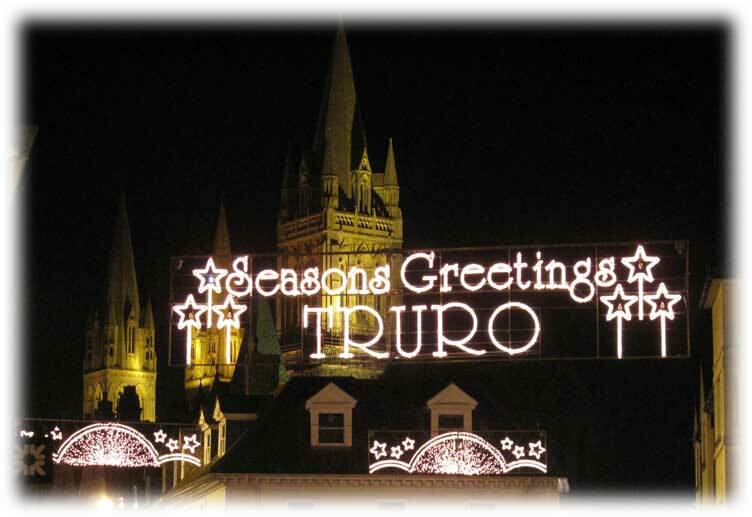 Be seen, click here to get your Town's Christmas Lights details listed on into Cornwall for this year. Starting at Willavean, Higher Road on with Procession led by Breage Band at 6.30 p.m. with Father Christmas and his sleigh. Lights blessed and switched on by Revd Penny Prince. Minced pies and mulled wine served in Breage Church plus seasonal music. Burgers and Hot Dogs with topping available outside the Queens Arms. A colourful display. Catch it before the 13th December. Starts at 4.45pm with the lights going on at 5pm with Santa making his way down Fore Street. There will be events all day from 10am - 7.30pm. Christmas Fair with a variety of stalls, perfect for finding Christmas gifts for all the family. Christmas entertainment and refreshments available. Santa will be in his Grotto, tickets are available from the Town Hall for £2.50, every child will receive a gift. The atmospheric Victorian Market in the Pannier Market starts at 4pm, another opportunity to soak up the Christmas atmosphere whilst looking for that special gift. The Santa Sprint Run sets off from the Bowling Club on Liskeard Road at 3pm, come along and cheer all the Santas on, or better still, sign up and run the sprint yourself! To finish off the day, there will be a Family Christmas Disco in the Town Hall from 5.30pm until 7.30pm, refreshments will be available. Entry is £1 per adult 50p per child. There will be FREE parking in the town so come along and enjoy the entertainment and support your local shops and businesses. Town Mayor will turn on the Lights of the Carbis Bay Community Tree outside the Methodist Chapel followed by a concert by the Community Choir. Entry is free. Donations welcome. The main tree is situated in the car park in Chacewater. Carols Round the Christmas Tree on Christmas Eve will be held there this year at 7.pm. Carols Round the Christmas Tree is Chacewater’s traditional get together to celebrate and [if they’ve been good!] a chance to meet Father Christmas bringing treats for the children. A festive community evening in Coverack with a lantern procession, Father Christmas in his pony drawn sleigh (so the reindeers can have a night off), carols and hot refreshments. There's a gift from Father Christmas for all children. Funds raised are for Coverack Christmas Lights. Join the Christmas celebrations as Falmouth schoolchildren parade through the town to The Moor for the annual lights switch on. The evening begins when schoolchildren representing the town’s primary schools, gather on Events Square with decorations and colourful withy lanterns. They are joined by a community choir and band and of course Santa before processing through the town towards The Moor. Once on The Moor, each school sings a Christmas carol on the state-of-the-art-stage before the big switch-on. The evening is organised by the Falmouth Town Team as always and compered by Pirate FM. The Falmouth Christmas lights are switched on each year by a nominated community champion. This is a person or group who after a public vote, gets to switch on the lights for that year. Santa is arriving in Fowey to switch on the Christmas lights. He arrives by tug boat at Berrills Yard and along with Fowey Town Band will lead a lantern parade through town for the big switch on and fireworks outside the church at 7pm. Old Chapel - main road in the village. 7.30pm lights switch on, BBQ, mulled wine and Cornish beers and gins, carols and music. 7.45pm outside the Coldstreamer Inn. With live music from Robin Curtis. Free mulled wine and guaranteed snow! Lights switched on at 6.30pm by Tiffany Truscott. Hot dogs, mulled wine, and a visit from Santa during the evening. A variety of food & craft traders, entertainers, Santa’s Grotto & much much more. The Mayor and Portreeve, Councillor Mark Smith will be kindly doing the honours. Festive lantern parade leaves Lanner School at 6.30pm. Christmas music, festive carols and a visit from Father Christmas. Festivities start at 6.30 pm with the switch on taking place at 7pm. All ages are welcome and entry is free. Liskeard Lights Up is Liskeard’s annual winter carnival. There will be a procession of lanterns followed by the switching on of the Christmas lights and a firework display. FREE party at the Public Hall with live music, food, pay bar and Cornish dancing. Meeting in The Square (outside the Marazion Hotel), for the big switch on at 7pm with carol singing to welcome Christmas to Marazion. Afterwards mulled wine and mince pies will be served in the Kings Arms. and mulled wine, Paella, Hotdogs, Pancakes, Crispy cakes and the famous Cornish Maids Hot Chocolate. The Brownies and Rainbows will be holding a lucky dip stall, Smart Penguin painting Christmas decorations and you can even sparkle for the evening by visiting Salon in the Square. A little elf has advised us that there will be a special visitor. Mawnan Primary School Choir sing some Christmas carols for all to join in. The lights will be turned on at 6pm. Food, drink and entertainment on the jetty from 5pm. Lights switch on 6pm. We suggest that you car share, if at all possible, as car parks fill quickly. Starts at 5.30pm with the arrival of Father Christmas in the turning circle in the village. Burger van and sweet stall and treats for kids. Procession through village and a Christmas service with mulled wine and mince pies in the barn. Newlyn Christmas Lights Switch On. This year’s event is set to be bigger and better than ever before! 4pm Live music and entertainment in the high street, including fire breathers, stilt walkers, dancers, and choirs. The Lantern Parade will be the biggest yet. The parade starts at Cliff Road and wends its way through the town to Fore Street. This year, an artist has been running workshops with the local schools and community groups on how to make the lanterns so expect them to be even more eye-catching and bigger than previous years! 7pm The Christmas Lights Switch On with some very special guests, including Joe Hurworth and Pirate FM. 8pm Spectacular firework display, provided by Newquay Town Council, set to explode over the harbour. Organised and funded by Newquay BID and Newquay Town Council. Newquay Late Night Shopping across the town on both Friday 30th November and Saturday 1st December. There will be a carol service on the band stand where The Padstow Carolers will be singing traditional Padstow Christmas Hymns. Porthleven Band will lead the invited guests and lantern parade from the Memorial Gardens at 6.15pm to the Town Centre where the lights will be switched on. The Chorus and The Suitcase Singers will be singing carols in the town. A Christmas Craft and Gift Fair will be in the Temperance Hall. Father Christmas and his Sleigh will be outside the Temperance Hall. Penzance will be illuminated with festive sparkle with the theme ‘Christmas Trees’. The lights switch-on takes place at 4.30pm at the Humphry Davy Statue at the top of Market Jew Street. Festive market, music and entertainment. The festive market will run from 11am until 5.30pm with a variety of stalls from Arts and Crafts to Food. Market Jew Street will also host a Youth Market from Pop Up Penzance. There will be a Santa's Grotto delivered by Penzance Rotary Club as well as musicians and bands playing throughout the town. Mulled wine, Roasted Chestnuts, Homemade Christmas gifts and cute little donkeys. We hear that Santa may be also paying a visit. So come on down and join in the fun. Soak up the festivities – listen to Porthleven Town Band, see Santa and marvel at the fireworks. St Breward Christmas Lights Switch on. At the Band Room, from 6.30pm. Father Christmas will be visiting with gifts for the children, light refreshments will be served, and the Silver Band will lead the carol singing. This will be followed by singing of Christmas carols accompanied by St Erth Concert Band and Viv's famous squash box. Pleas note, if the weather decides to be inclement then we are afraid that we will be canceling the event but the lights will still be switched on at 7.30pm regardless. At around 6.30 the St Ives Lantern Parade will sing and dance its way into Royal Square, accompanied by the drums of Celtic Samba, for the countdown to the Christmas Lights Switch On. The Mayor will be joined for the switch-on by local Sam Harper Miller, who was nominated by the people of St Ives. Events start in the Square at 6.30pm with community carol singing accompanied by St Keverne Band, leading up to the switching on of the lights at 7pm. Switching on of Harbour Christmas Lights 6pm at St Mawes Arcade. Christmas Festival celebrating Christmas in Tintagel. Light switch on, funfair rides, games, Santa’s grotto and much much more. 28th November to 19th December. Click the link below for 100s more towns and villages in Cornwall and the Isles of Scilly.